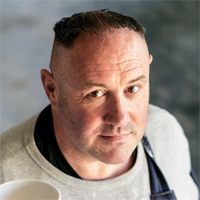 Now based in Redruth, Cornwall he has spent the last seven years enjoying working in the South West delivering projects and training throughout Cornwall, Devon and The Isles of Scilly. 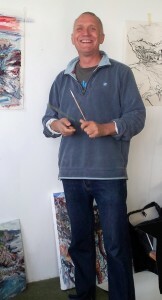 – When Tony isn’t working in schools he will usually be found scaling cliffs near his Cornish studio with canvas, easel and paints indulging in ‘extreme landscape painting’ – a risky combination of painting, climbing (and falling!) and getting soaked by crashing waves. 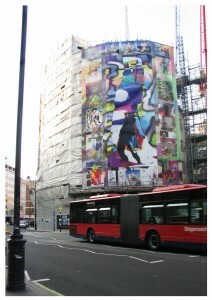 – One of Tony’s largest commissions with schools involved wrapping a 5 storey banner around the BBC’s Broadcasting House. The artwork covered 330 square metres of fabric and must be the largest pupil-generated digital artwork ever made. Printed on vinyl, it was so large that when the BBC finished with it Tony was able to cut it up into 120 multi-coloured tablecloths! – Tony once used screen printed fabric to transform a huge underground car park at the Barbican centre into a magical ‘Poetry Forest’ to inspire 100’s of visiting school children to write poems and hang them from the trees. – Tony decorated the inside of St Paul’s Cathedral for the Children’s Millennium Service with gigantic colourful banners featuring screen printed artwork from over 2000 children from 40 different schools across London. – Tony worked with schools in Cornwall making props and costumes for an ambitious beach performance of Shakespeare’s ‘Tempest’ featuring a giant tall ship and a cast of thousands – on the day of the performance a real storm swept in from the Atlantic ocean breaking up the ship exactly on cue to the delight of the windswept audience!